When I first saw this picture of the 1960 Mercedes-Benz W118 prototype, my first thought was how much it looks like a Mercedes-built BMW 2002. And while the BMW Neue Klasse of cars may have been influenced by this prototype, what I didn’t realize was that this charming little car held the future of post-Beetle Volkswagen. This Benz prototype is really the seed of modern VW. I’ll explain. In 1958, Mercedes-Benz bought most (the next year, all) of Auto Union, which before the war made cars that spanned a huge range of classes (remember, this was a union of four companies, Audi, DKW, Horch, and Wanderer.) But after reforming post-World War II, the company mostly focused on its two-stroke DKW economy models. Mercedes wanted DKW to cover the low-end of the market, and the brand did that quite well. The problem was that as Germany and Europe progressively started to recover from the war economically, the demand for the crude two-stroke DKWs was falling, until Mercedes saw that they’d be stuck with only East Germans wanting the smoky, smelly things. They realized they needed a new four-stroke model for the market below Mercedes’ usual offerings, and so began development on the prototypes to be called W118 and W119. Ludwig Krauss headed up the development team, and under him new engines were developed for this front-wheel drive car: first, a 1.5-liter flat-four, and soon after an inline-four of 1.7 liters with a fairly high (11.2:1) compression ratio. This inline, water-cooled, high-compression engine was called the “H-engine,” and it looked quite promising. Aesthetically, the W118 and W119 prototypes, in two and four-door forms, were really quite lovely. They borrowed a lot of styling cues from the W113 SL Pagoda series of sports coupés and convertibles, including the full-width grille with large central three-point star badge, the thin-pillared, airy greenhouse, the taillight treatment, and the overall clean, crisp look. I think they look fantastic, with all the best qualities of the BMW 2002 that would come later, but with perhaps even a bit more charm. I have no idea where the front indicators are, though. In his luggage he had the plans for the W 119 model series and the H-engine. This came to be used from the mid-1960s at Auto Union, where it was designated the “intermediate pressure engine”. As a result, Daimler-Benz provided the subsidiary with a solution to the two-stroke engines, which were no longer considered contemporary, in the form of more modern four-stroke engines. Auto Union was sold to Volkswagen in 1964/65. There’s a hell of a lot going on in that paragraph, so let’s comb through it in detail. The DKW F102 did manage to get to production with DKW’s last two-stroke engine, but, as Mercedes predicted, the public was moving away from two-strokes, and the F102 didn’t sell very well. Now, what happens next is really important. After all this development of the new engine and revitalizing two-stroke DKW into four-stroke Audi, Mercedes-Benz decided they needed money to build a truck plant, so they sold DKW/Auto-Union to Volkswagen in 1964. Krauss and his plans for the H-engine stayed with DKW in Ingolstadt when the whole strudel went over to VW. The DKW F102 was modified to accept the four-stroke H-engine in a longitudinal FWD setup, and that car became the F103, now called an Audi, to help separate it from DKW’s two-stroke association. Krauss was made Chief Engineer at Auto Union/Audi, and Volkswagen allowed him to develop his water-cooled, in-line, FWD drivetrains independently of VW’s traditional rear-engine, air-cooled, opposed-engine motif. While the first water-cooled, in-line, FWD Volkswagens were re-badged NSU K70s (VW bought NSU in 1969 and merged them with Audi), the real source of Volkswagen’s future water-cooled, FWD line came from Auto Union/Audi. The successor to the Audi F103 was the Audi 80, which was re-badged as the Volkswagen Passat in 1973, the first water-cooled, FWD Volkswagen to sell in any quantity. The next year, Volkswagen turned the water-cooled inline-four 90° and developed the VW Golf, the first car that actually managed to be a viable replacement for Volkswagen’s iconic Beetle. Ever since then, Volkswagen (aside from rear-engined and air-cooled holdouts in Brazil, Mexico, and South Africa) has been a company that makes front-drive, water-cooled cars. 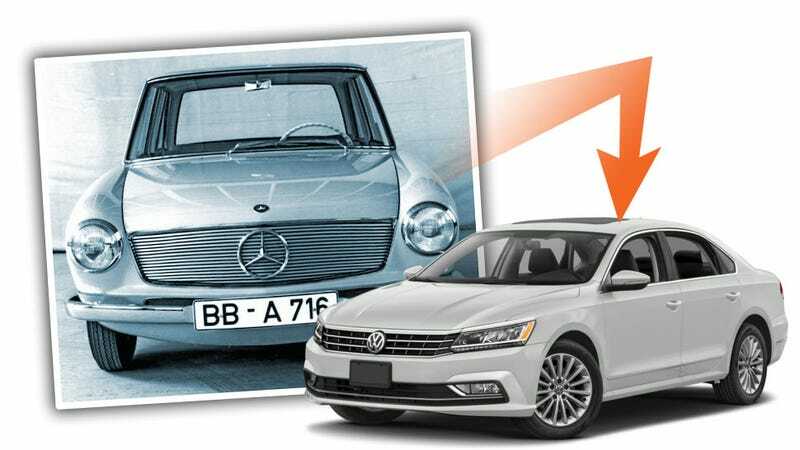 It’s pretty amazing to think that the way back in the early 1960s, Mercedes-Benz was developing what would become Volkswagen’s future. I’m pretty sure that wasn’t part of the original plan. Does this mean we can blame Dieselgate on Benz?